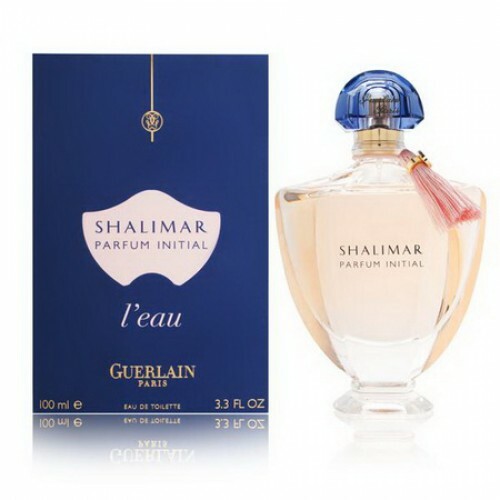 Guerlain Shalimar Parfum Initial L'eau is a real jewel among fragrances. Guerlain Shalimar Parfum Initial L'eau 100ml. Eau De Toilette is fabulous news for women, which was launched in 2012. This perfume is among pleasantly sweet, fruity-floral fragrance with subtle accents orange. Versatile and very charming tones are suitable for any weather. It is a lightweight version of the beloved Shalimar Parfum Initial, from which he takes an incredibly seductive touch of luxury and gentility, and adds to it a small dose of freshness and vitality. Therefore, you are perfect on every occasion when you need to feel beautiful, slightly sensual and above all this! A worldwide brand Guerlain created this heavenly splendor for all women who love the feeling of harmony and harmony, love to let themselves be pampered luxury and yet crave a light floral fragrance, but in any event not one of the dozen. This has been reflected perfect look bottle. It is made of high quality glass, custom interesting shape and distinctive blue cap. Bottle is also decorated with applique, which evokes the sensuality of the Orient and the land of the rising sun. The box is colored in midnight blue and indicates the prestige, high quality and taste. The perfect interplay of individual elements make perfume Shalimar Parfum Initial l'Eau real jewel among fragrances. It starts quite fresh, fruity, which is dominated by gently bitter neroli, juicy grapefruit, sweet orange and bergamot significant. The heart is composed of passionate petals of rose, freesia, hyacinth, lily of the valley gentle, specific iris and exotic jasmine. In the end, you can enjoy for a long time sweet scent of vanilla, which is sensually blended with a warm tonka bean. Shalimar Parfum Initial l'Eau lasts on your skin even many hours after application. The world-famous brand of perfume Guerlain, whose roots go back to ancient history, are often enrolled with its unique scents into the Hall of Fame. Let yourself enchanted by the success and reputation of this famous brand. From its exceptionally wide range chooses absolutely everyone. Just close your eyes and imagine the smell after what you desire most. It's a rich oriental, seductive elegance and youthful freshness? And what about the dainty flowers and distinctive spices? Selects each, with a good dose of style and taste. Guerlain Shalimar Parfum Initial l'Eau is perfect splendor of flowers, fruits and sweet tones of exotic faraway places. Princess who wears this fragrance is constantly needs surrounding its fascinating fragrance. Shalimar Parfum Initial l'Eau is simply a matter addictive and definitely one gets into the Hall of famous perfume world.